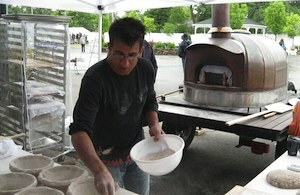 Barak Olins teaches a class on baking with rye at the Kneading Conference. Photo credit: Amy Halloran. The “we” included masons, bakers, chef, and community members – people who realized that farmers, bakers, millers and oven makers have to talk about their overlapping interests. Working within a commodity system segregates such would-be allies, but as this and other regions of small scale grain production have developed, more and more of these conversations are happening. Many of them begin in central Maine in the last week of July, and others start at the Kneading Conference West, in Washington’s Skagit Valley mid-September. In Skowhegan, the talk has become action. Amber Lambke and baker Michael Scholz have opened a flour mill in the former county jail. This is tangible infrastructure, but the communication fostered by these conferences functions like an invisible spiderweb, developing relationships and networks required for localized grain production. Sure, people need land, seeds, combines, and bins. But without a miller, and a baker ready to use local flour, a farmer can’t pay bills. The Kneading Conference West is in its 4th year, and was initiated by Steve Jones, director of the Mount Vernon research station at Washington State University. A speaker at the conference in Maine, he wanted to carry the energy and community building capacity home. Both events include baking and wood fired oven workshops, plus panel discussions on the businesses of artisan baking, milling and farming. People come from across the country and around the world. You’ll find self-described breadheads who are a mix of professional and serious home bakers, plus farmers, food advocates, and others involved in helping advance the restoration of staple crops. Hitz has led many workshops in Maine. His awareness of farmers and millers has grown as he’s listened to them discuss their work and concerns. Knowing what goes into getting flour into a bag makes him appreciate the process, and his place in the cycle. This kind of understanding is very exciting, said Ellen Mallory, agronomist and sustainable agriculture specialist from the University Maine. Mallory researches small grains varieties and cultural practices in the course of her work, and as part of the Northern New England Bread Wheat Project. She sits on the board of the Maine Grain Alliance, the nonprofit that runs the conference. The organization serves regional grain production year round through education and outreach efforts using a mobile bread oven, and, now, baking classes. These classes will be held at the Somerset Grist Mill – the name for food-based community center that sits in the former jail. Since September 2012, when the gristmill opened, 50 tons of flour, and 30 tons of oats have been milled from Maine grown grains. The products matter in and of themselves, but also because they represent to farmers that there is a market for new crops. A significant client is Whole Foods, which contracted for 30 tons of organic flour starting in September of this year. The flour will go to the company’s central bakery in Massachusetts and the bread, with its Maine origins well labeled, will reach up to 70 bakeries in the North and Mid-Atlantic region. Wheat for this project is being grown by Tate McPherson, a seed grower in Aroostook County. The farmer is also organizing resources for a grain depot in his area, a prime agricultural region also known as The County. He’s raised funds for storage and cleaning facilities that will help farmers grow and process grains. This is not brand new for the state. In 1830, Somerset County grew 239,000 bushels of wheat. During the Civil War, Maine was a breadbasket for the Union Army. 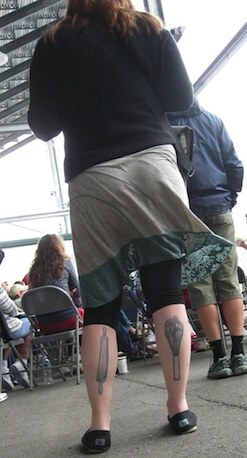 The legs say it all at the Kneading Conference in Maine. Photo Credit: Amy Halloran. Farmers in the Skagit Valley grow grains in rotation with their cash crops: tulips, potatoes, vegetables and vegetable seeds. However, what they grow is sold for little money on the commodity market. The Kneading Conference West is an extension of the year round work undertaken at WSU’s Mount Vernon station to help farmers. Steve Jones wants to make grains work harder for farmers. He and his colleagues breed new wheats, developing performance in the field and in the kitchen, working with farmers, bakers, maltsters, and millers on flavors and functionality. The Kneading Conference West will show how that vision is working, from field to loaf.